These Spring and Summer Seasonal Edition Thai Sweet Chilli, Lemongrass & Coriander Kettle Chips were presented in the usual big sharing bag (or Movie Bowl Edition for greedy-guts like me). Not keen on lemongrass Cinabar wanted me to try these crisps first. Too much lemongrass can make crisps taste a little like crunchy washing-up liquid, but with over thirty years experience of making crisps Kettle Chips have never let me down. I do love Thai food and with fresh flavours of coriander, sweet chilli and lemongrass these crisps sounded like a perfect combination. To help with the Oriental flavours I had a mug of green tea with my lunch and the crisps in a big bowl. I also thought these crisps would complement the sunny day outside washed down with a cold American beer from the fridge and a Key Lime Pie for afters for a nod to Kettle Chips heritage. 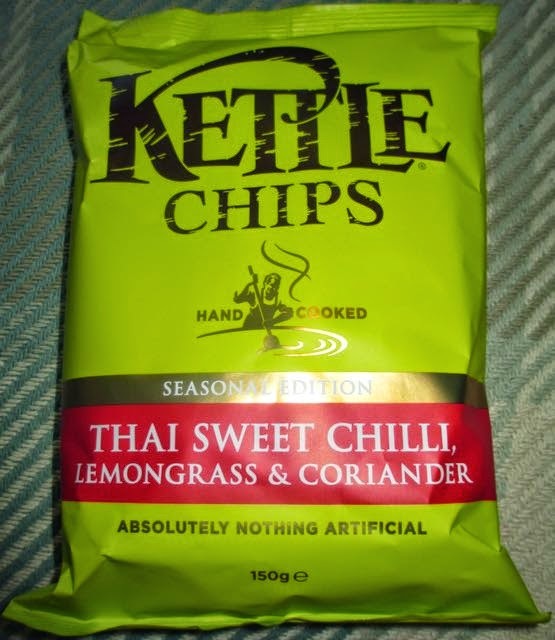 I was pleased by the spicy sweet chilli smell on opening the crisps with a lighter lemongrass and coriander odour, with mixed herbs and a little ginger in the background. On first crunchy taste the flavours from the smell seemed to wash in fresh waves like a friendly lapping sea upon a sandy beach on bright sunny day. The dominant chilli woke the senses with the lemongrass lightly complementing the flavour instead of scaring it away. No washing-up liquid flavour here, just pure Thai bliss. Each crisp yielded a slightly different flavour too. There was more tomato in some, there was paprika, onion, ginger and varying herby strengths of cumin, coriander and oregano. Rarely can I pick such fresh and healthy tasting flavours in a packet of crisps. I'm not exaggerating when I say this is what I believe Thai crisps should taste like. They went superbly with my fishy tuna sandwich, washed down with the Tap Room IPA beer and then the Key Lime Pie just rounded off the whole experience. Well done Kettle Chips. Make this a regular. These crisps would be ideal for a spicy treat on a sunny day with all the family and or friends around in the garden for a nibbles buffet with some other spicy treats from the Deli Counter. 150g packet at 517 calories per 100g, with 30.5g of fat and 1.6g of sugar. No artificial MSG, colours or flavours. Ingredients included; potatoes, sunflower oil, sugar, rice flour, dried onion, sea salt, yeast extract, dried garlic, dried tomato, coriander, ginger, galangal, star anise, chilli, cumin, oregano, citric acid, chilli extract, capsicum extract, paprika extract, lemongrass flavouring, and coriander extract.